Which One Looks Like The Original? Which reproduction footwear do you want to wear? Which Sole Shape Looks Like The Original? Which reproduction sole shape do you want on your footwear? 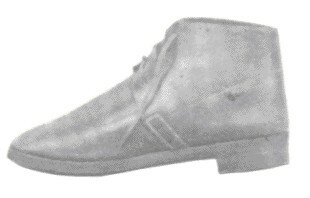 Our high quality reproduction footwear is built on copies of original lasts* in our private collection. 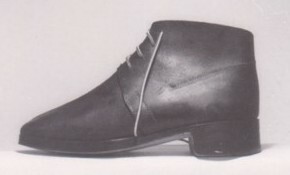 These unused dated pattern lasts were reproduced, under contract, exclusively for Missouri Boot and Shoe Company by a major United States last manufacturer. The uppers of our footwear are patterned form original specimens, original patterns, government specifications and, occasionaly, period artwork and photographs. 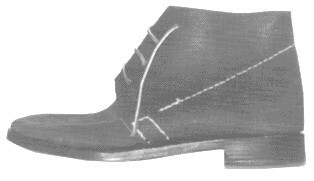 We have in our private collection a number of pieces of original footwear, and a complete set of original, proportional sliding boot makers patterns patented in 1863. Missouri Boot and Shoe Company is dedicated to providing its customers with highly detailed, museum quality reproductions of original footwear. *Lasts-The varied size forms that shoes and boots are shaped on.